It was never my intention to visit a cat cafe. In fact, I had absolutely no interest in visiting one. Mainly because I was traumatised by a bad cat experience when I was young – my parents love to have that story retold to people over and over again. It has taken me this long to even voluntarily stroke a cat. One does not account for a very persuasive cousin though. She had wanted to visit one but as the guide bringing her around Seoul, I had the final say over her itinerary. So, cat cafe was out. I just told her that it was not guaranteed. Well, they say karma bites. Indeed, as fate would have it, it seemed almost like serendipity that I would have ended up there after all. Shopping around Hongdae area, I almost walked past the sign and almost, almost, ignored it. For the sake of loyalty though, I very reluctantly pointed it out to my cousin and asked the dreaded question, “Do you want to drop in to take a look?”. It was such an obvious question. So I ended up trudging up the stairs to a small shop and was greeted with the joyful sight of cats everywhere. How cattlicious! The shop helpers were familiar with foreigners, it would seem. With no words spoken, we had our belongings kept away in bags, hands sanitised, made to read the rules (in English) and paid for a drink. No entrance fee but you have to buy a drink. It only cost about $8 so I suppose it’s not much since you get to play with the cats for however long you wished to. The cats came in all shapes and sizes, even kittens. And okay, they were pretty cute….VERY CUTE. Am I cute or AM I CUTE?? But hey, I’m happy enough that they did not cuddle because I have not worked myself up to that stage yet. My cousin was a bit disappointed but she did manage to get some cuddles by the time we left. Patience is required for them to trust you, I suppose. At the end of the day, I’m happy enough that I can strike this off my list. 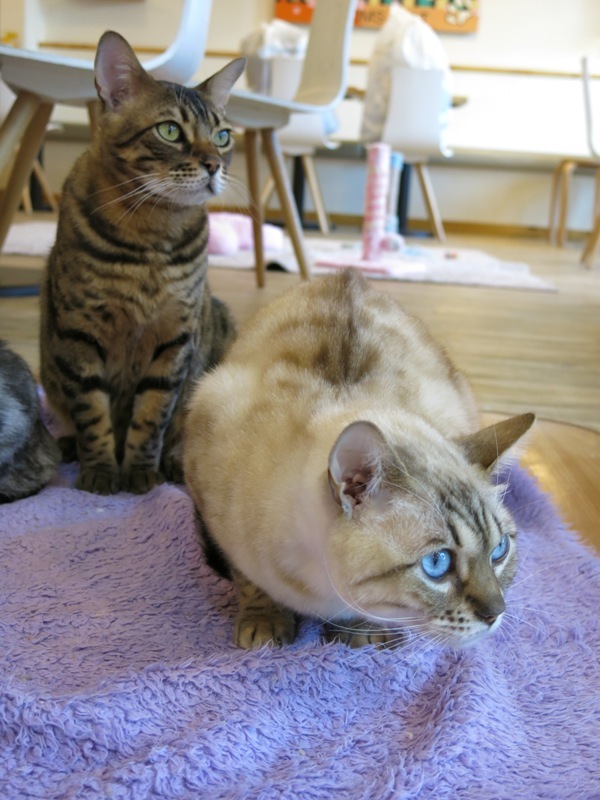 I have visited a cat cafe in Seoul. It’s definitely a great idea for those who cannot afford to keep cats as pets but it is just not for me. 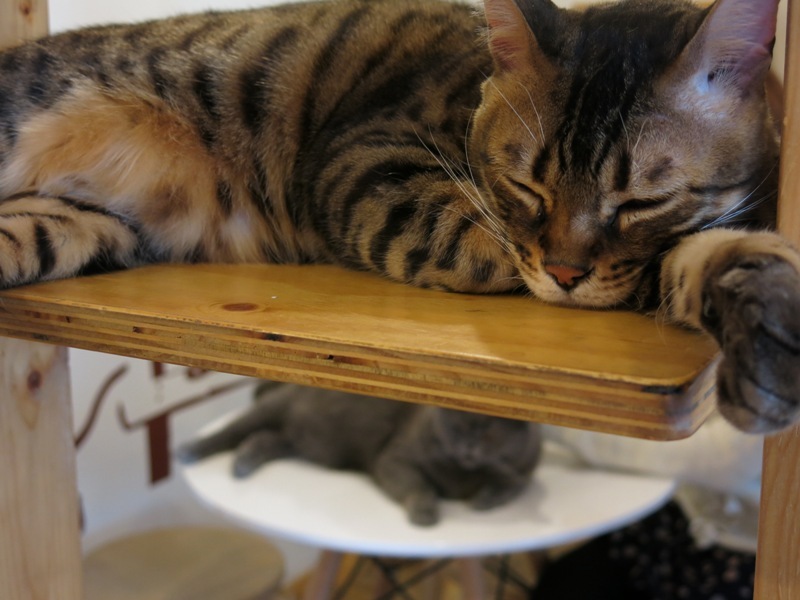 For those interested, I visited Tom’s Cat Cafe in Hongdae area. Since this was a random walk-by, I can probably telepathically think out the directions to tell you. Otherwise, it is a bit hard for me to describe in words other than – it’s opposite that building with a shop (it’s called Art Box, I think) and is on the 3rd floor along the same street of the Hongdae playground. Alternatively, you can also choose to trust online reviews which says that they have moved or gone out of business. You can refer to this page for alternatives though. Have you encountered such shops in your travels? Is there any other unique shops that you’ve visited before? Please do share! Shopping in Seoul – My Favourite Haunts! ← My Dumbest Moment Ever! Lol, really? Hmm, maybe the rules are more relaxed in Korea because such animal themed cafes are everywhere. I was recently reading a post form Korea on dog menu items so that is why it came to mind Sha. Ugh. Yes I think very different rules here. I have seen a few of your earlier posts where you mentioned cat cafes and I was intrigued. We don’t have anything like that in the US. I think this is such an amazing idea. There are so many in this country that would just adore to sit in a cat cafe and enjoy the animals. I wonder why it has never taken off here? I loved this blog! The cats are just adorable. I’m glad you came to peace with your earlier trauma. Haha, yes. My family love to tease me about my aversion to cats when I was younger but as I got older, I just couldn’t resist them, especially when they seemed so cute. I can’t make myself cuddle or carry them though, just stroking them is good enough for me. I don’t think you CAN get too many pictures of cats, lol. In some of your earlier photos of cat cafes they had purebred Persians. Oh my goodness. So lovely! Yeah cats are addictive, lol. The cafe’s are a great idea for city dwellers without access to pets. It’s perfect. yeah I’m a dog person myself… not quite sure of the allure of these cat cafes but they are a novelty I guess! 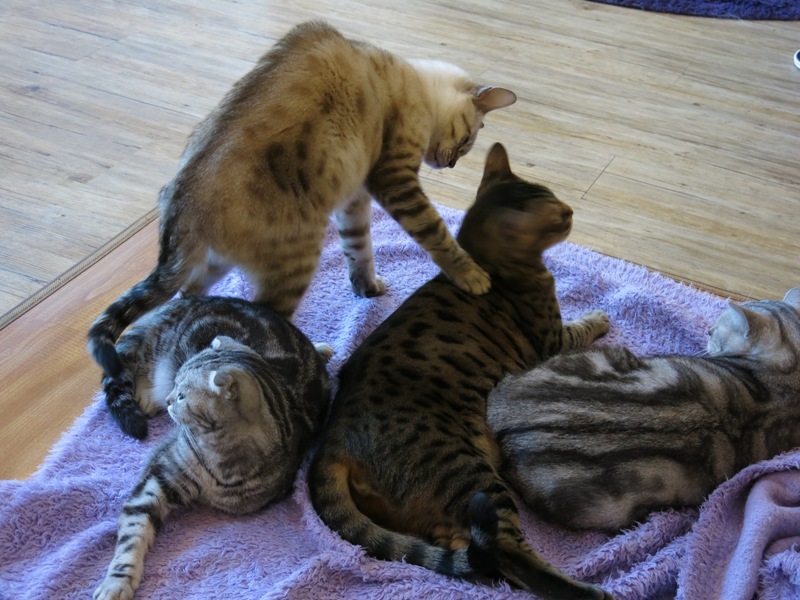 Thanks for linking to our cat cafe post on our travel blog Independent Travel Cats, it is a popular one. So when I was in Seoul this Spring, Tom’s Cat Cafe was definitely closed (you can see the pics on our blog, the place was dirty, and there was almost nothing in the space) and another business owner in the building told us they were not there anymore and did not think they had moved anywhere. Other travelers have reported similar experiences when trying to visit (as recently as 2 weeks ago on Tripadvisor) when visiting this location. I wonder if they somehow miraculously re-opened very quickly, if they moved nearby, or you found another cat cafe nearby and mistook it for Tom’s as the name is still on the building? Would love to know more and share any updates with our readers as we get a lot of being coming to our website and emailing us about pet cafes. Do you happen to know the address? Yes, I’ve heard good things about that cat cafe which is why we searched for it. Too bad it seems to have gone out of business, but at least there seems to be a few other pet cafes in the same area near the university. are you serious?? Tell me if you ever visit one, or even better, blog about it with some pictures of the dogs hahaa 😀 I havent heard about dog cafes around here! not yet! Hello Sha! When did you go to Tom’s Cat Cafe? When I went in April, the place seem closed. or have they moved? I ended up going to Cat’s Attic. I’ve never visited that one in Seoul but one time in Gwangju, we visited a cat cafe. It was nice enough but not really my thing, though my wife will beg to differ. Cute shots though. Hongdae really has everything, huh? No need to visit Itaewon, i think! Very cute and cuddly-looking! I’m more of a dog person, but I wouldn’t mind spending some time with these cute little things. Oh, they are adorable! I love cats so much: a childhood deprived of any pets has made me slightly obsessive about animals! My travel buddy in Latin America got so annoyed with me stopping to play with all the strays. 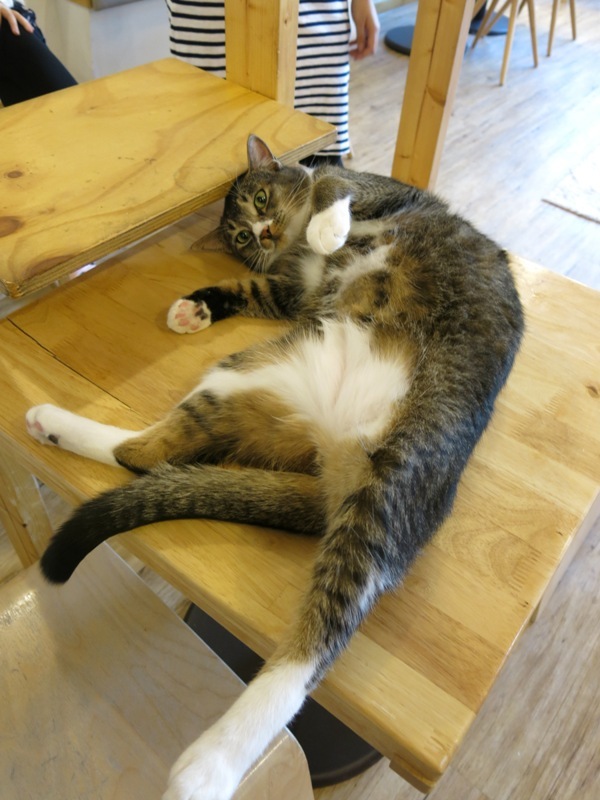 I love the photo of the cat on its back, I just want to rub its belly 🙂 This post has just increased my desperation to get to Seoul and visit a cat café! I have yet to visit the one in Singapore but everyone keeps telling me about it. I’m surprised they opened it up here given how strict the health regulations can be, but of course they are also willing to be a bit more flexible with changes here (pets and cafes don’t legally mix in Brisbane last I checked).